Dwarf shrimp are adorable, easy to care for aquatics. But if you’re like me and simply can’t abide a single species tank – they need places to hide if you want them to propagate. 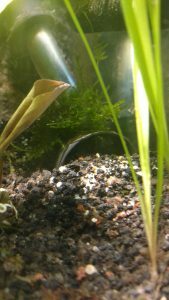 Even supposedly shrimp-safe fish, like the peaceful micro rasboras and the weensy dwarf amber barb, will eat shrimplets. 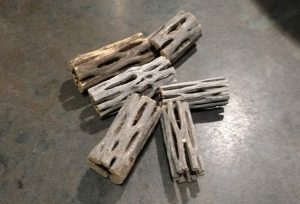 Though tangles of driftwood and tumbles of rock will help, the more hides the better. But, the price tags on shrimp hides is appalling! Ack. So here’s some free or low-cost alternatives. If you’re into dwarf shrimp, chances are you have one (or several!) planted tanks. 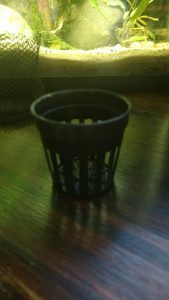 Know those small, black baskets that come with aquatic plants? They make awesome hides! And they’re free. You can stick them in the substrate as-is, or weave moss through the slits to create a moss top, like I did here with strands of phoenix moss. 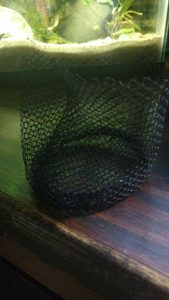 If moss isn’t your gig, scraps of non-metal screen attached with aquarium safe silicone works well too. One of our lawn chairs broke, so I cut out the mesh cup holder and used that. 100% free hides! Another inexpensive solution that also conditions your water is cholla. I like to get them in lengths and then scare the crap out of everyone by using power tools to cut them into pieces. 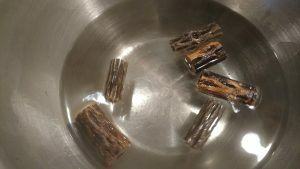 After cutting, stick them in a bowl, pour boiling water on them, and then wait until they expand bit and sink (usually within 24-hours). Even expanded, their holes are so thin that only the most determined of fish could reach your shrimplets. Or any other aquarium safe material you have on hand that can provide cover for your shrimp. Get creative and alternatives will abound.